Lightly grease a half baking sheet and line with waxed paper. Lightly grease the wax paper and set aside. Melt butter in a large saucepan over medium heat. Add marshmallows and salt, and stir occasionally until marshmallows have melted (approximately 5 minutes). 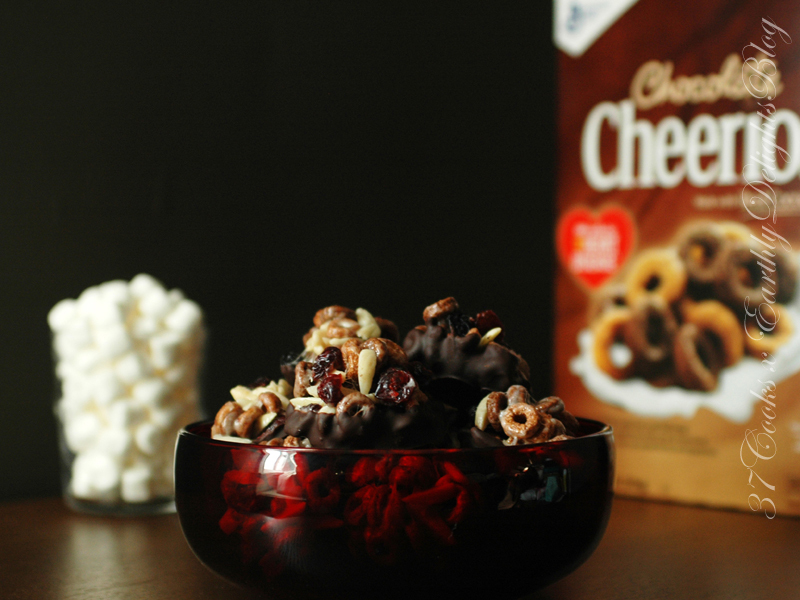 Remove from heat and stir in the Chocolate Cheerios, dried fruit and nuts. Working quickly, take small handfuls with lightly greased hands and form into clusters. Place on prepared baking sheet. If using, melt chocolate over a double boiler until smooth, then dip cluster bottoms in the chocolate. 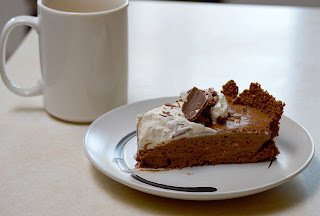 Let set for 30 minutes in fridge (or until the chocolate is solid). We all know the baked breaded pork chop - but this recipe takes it up a notch or two by using sweet chili sauce for dredging whereby giving it a sweet and savory all its' own and the sweetness from the Golden Grahams gives it a nice sweet crunchiness. Preheat oven to 350°F. Rinse pork chops under cold water and pat dry with paper towels. Place General Mills Golden Grahams cereal into food processor and give it a quick pulse two or three times (you want there to be larger chunks of the cereal). 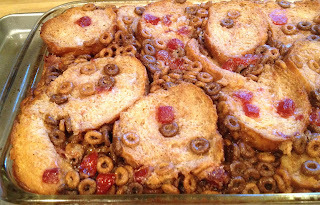 Completely dredge chops in the sweet chili sauce then coat the chops in the processed Golden Grahams cereal. Place on wire rack/baking sheet and bake for 45 minutes. About 6 years ago, I received news that would forever change my life. I went to the doctor after several years of being apart, only to be told our relationship was going to get deeper. I was diagnosed with Type 2 Diabetes. It was shocking, I was emotional. I never felt like I had any symptoms and was/am a pretty healthy eater, despite the extra pounds I carry. My family was pretty shocked, too. Since being diagnosed, I am even more aware of everything that I eat, good and bad. Coming up with different meals for my fickle palate was going to be a challenge, while staying in my new carb guidelines. It truly has been a challenge, which is why I was very excited to be given the opportunity to check out this new cookbook! I truly love that it's a seasonal cookbook as well, with the chapters divided into seasonal meal plans and recipes. What inspires you this time of year? Just turn to Spring to find out! 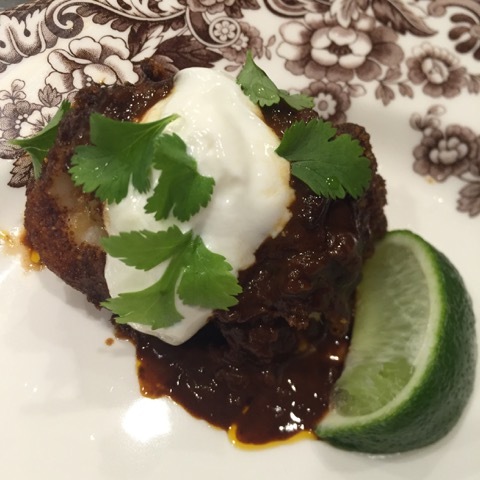 I guess I must be thinking about Summer with the Cuban Spiced Chicken recipe I chose! In a small bowl, combine first 7 ingredients (paprika through salt). In a medium bowl, mix 1-2 Tablespoons lime juice and 1 Tablespoon extra virgin olive oil, then add chicken and mix. Place chicken on baking sheet and bake, uncovered, for 30-40 minutes. I look forward to trying many more recipes from this book! When I heard that 37 Cooks was being sponsored by General Mills, I was really excited! I mean, come on, General Mills? That's the big time, folks! Their challenge was to come up with a recipe or two, using the cereals that General Mills to sent us. I really had to think this out. I wanted something a little different, as well as delicious! 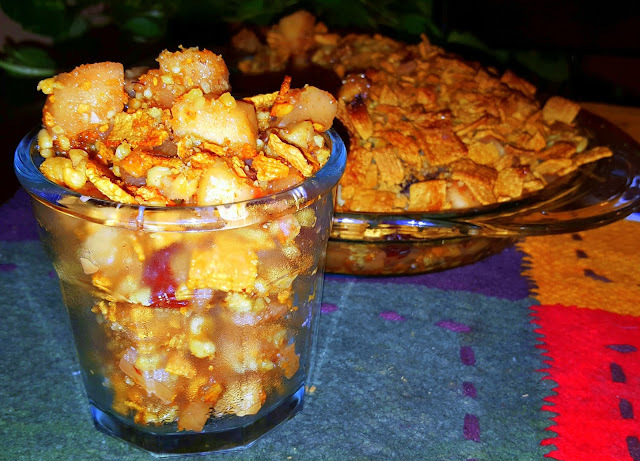 Most of the time when I make stuffing, I love to add some fruit to it, either apples or raisins, as well as a little spice. 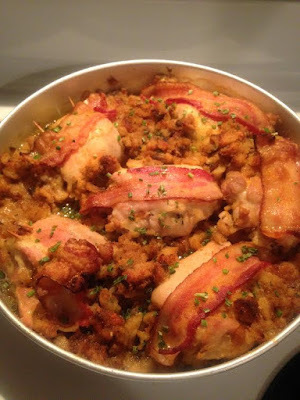 I decided on Sweet and Savory Stuffed Chicken Thighs, using Trix cereal mixed in with stuffing and it worked out great! Preheat the oven to 375°F. Saute the onion in one Tablespoon butter or bacon grease. Bring to a boil the chicken stock and 4 Tablespoons butter, add the sauteed onion, the red pepper flakes, stuffing mix, and the Trix. Stir well to combine, take off the heat, and set aside, to cool. You want the stuffing to be fairly dry, so keep the lid offa the pot. While the stuffing is cooling, lay each boneless chicken thigh on a cutting board and either pound them a little thinner, or fillet them open with a sharp knife. When stuffing is cool, place a heaping Tablespoon or two, depending on the size of the chicken thighs, on one end of each thigh. Fold the other side of the thigh over the stuffing and secure with toothpicks or skewers. Warning!! This is not the time to be all OCD. This stuffing will be all over the place, so don't try to make nice and neat little bundles. That's gonna be way too much work. Place the stuffed thighs in a baking pan, leaving enough room to put the extra stuffing around the chicken bundles. Lay the bacon strips on top of the thighs, tucking the ends under. Cover and bake for 20 minutes, then turn oven up to 425°F, uncover pan, and bake another 20 minutes until chicken is 160°F. If the bacon is not done enough for you, simply turn on the broiler, and broil till the bacon's done (I don't like really crispy bacon, so there was no need for me to do this). Serve with couscous, and garlicky green beans! It is a great time of the year when the fish start biting. I was lucky enough to be included on a fishing trip recently and we had a blast. We caught a bunch of fish, so I decided what better time for this General Mills Challenge! I decided to use Golden Grahams as a breading and it did not disappoint! It added a nice sweet taste to the already delicious white perch! Pour the recommended amount of oil in your fryer, and heat to 375°F. Season fish with seasoning. Beat eggs in a mixing bowl, then add buttermilk and stir. Mix flour and crushed cereal well in a bowl and set aside. Take one seasoned fillet and soak in egg wash, remove from egg wash and place fillet into the batter and coat both sides well. Bring back to egg wash. Once dipped into egg wash the second time, place the fillet back into the batter and coat both sides well. Place each fillet aside on a cutting board until all fillets are battered. Carefully place fillets into fryer and fry until they are golden brown or until they float to the top. Once cooked, place cooked fillets onto a baking rack so that the bottom of the fillets do not get soggy. Once cooled enough, go ahead and indulge on the great flavor that the Golden Grahams give the fish. The sweet and fiery Golden Graham Nut Clusters compliment this tangy, crunchy apple fennel salad. You could also add some cooked chicken breast or turkey breast for a main dish salad. Line a sheet pan with parchment paper and spread out the Golden Grahams and toasted nuts on it. In a small sauce pan over medium heat, combine the remaining ingredients and bring to just a simmer and remove from heat. Let the honey mixture cool slightly and then pour over the sheet pan of Golden Grahams and nuts. Toss to combine and spread mixture out on parchment-lined pan. Place in 300°F oven for 6 minutes. Remove the pan from the oven and stir, breaking up any larger clumps, spreading out evenly, and return to the oven for another 6 minutes. Remove from oven, stir and let cool for 2 or 3 hours. Make sure you save some for the salad! In a medium bowl, dissolve honey and salt in the juice and vinegar. Add the sour cream and mayonnaise and stir to combine. Add the remaining ingredients in with the sour cream mixture and toss lightly to combine. Serve in individual bowls or a small serving dish and garnish the top(s) with reserved fennel frond pieces and a few more Fiery Golden Graham Nut Clusters. In 2005, family friends came to stay with us to escape Hurricane Katrina. The returned home to freezers and refrigerators of lost food. In 2008, they returned to escape Hurricane Gustav. This time they came bearing ice chests full of Gulf Coast delicacies. One of my husband's favorite meals was Gram’s Crab Cakes. The official recipe was Maryland Crab Cakes from Inside America’s Test Kitchen, but he still affectionately refers to them as Gram's Crab Cakes. 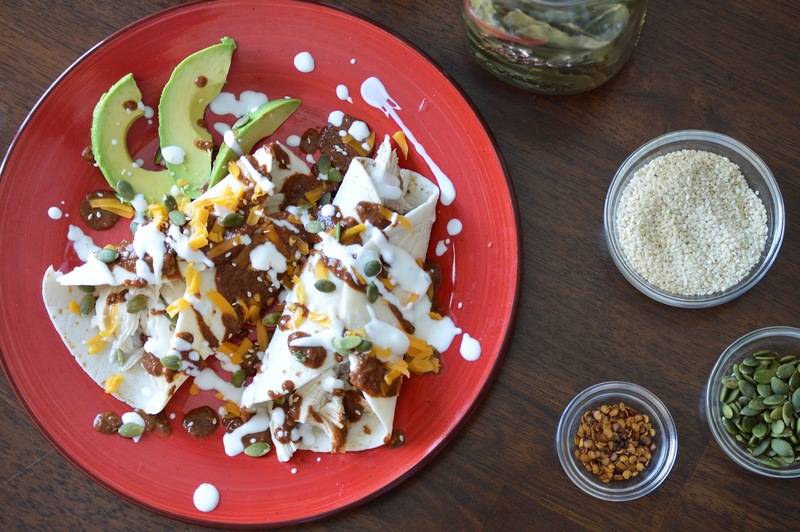 This recipe combined with a simple mole sauce to create another family favorite. My youngest did prefer his shrimp without stuffing. This would also be great with chicken instead of shrimp. Heat your olive oil over medium-low heat in a large, heavy-bottomed pan. I like my cast iron chicken fryer for this. Add the onion, garlic, oregano, cumin and cinnamon to the oil. Cook for about 10 minutes, until the onion is tender. 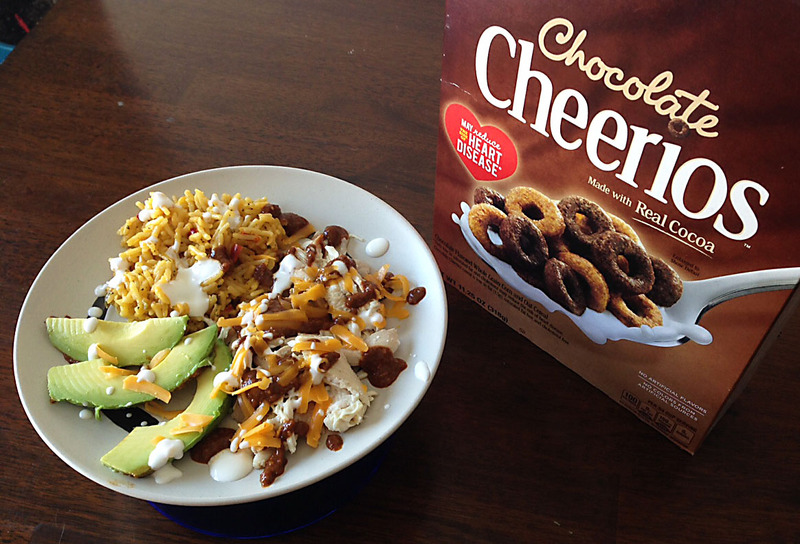 Add your chili powder and crushed Chocolate Cheerios. Stir until incorporated into the onion mixture. Slowly add the chicken broth and increase the heat to medium-high. Boil until the sauce reduces. When reduced it should be similar in consistency to a hollandaise sauce. While the sauce reduces ,you can prepare the shrimp and stuffing. In a large bowl mix the crabmeat, scallions, cilantro, chili powder, cinnamon, cumin, oregano, Chocolate Cheerios, and mayonnaise. Be careful not to break up the crabmeat. Gently fold in the egg. The mixture should hold together at this point. If it doesn’t, more crushed Cheerios can be added. Stuff each shrimp with the crabmeat mixture. Each should hold a golf ball-sized mound of stuffing. Drizzle your stuffed shrimp with olive oil and lightly coat with the mixture of Cheerios and spices. Place on a baking sheet lined with parchment paper. Bake at 350°F for 12-15 minutes, until shrimp is done. 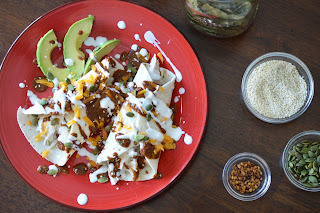 Serve with mole sauce and enjoy! I really enjoy The Six O'Clock Scramble Meal Planner: A Year of Quick, Delicious Meals to Help You Prevent and Manage Diabetes. It is actually more than just a cookbook. This book is perfect if you like to plan and prepare to get yourself ready for an easy week. I find that my weeks are much smoother and enjoyable if I have a plan of what we will be eating. 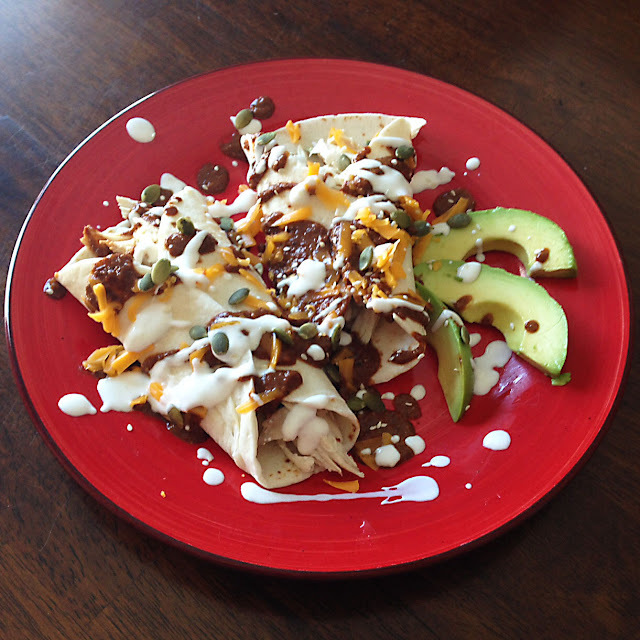 The variety of fast, easy meals are perfect for any family. My husband and I are looking forward to using this book to try new recipes while still being conscious of our health. If you’re looking for an easy, healthy meal plan to follow, I suggest this book. Another thing I enjoy about the book is that the recipes are not only diverse, but also easy and quick for the busy home cook. Heat a large skillet on the stove over medium-high heat. Coat the pan with the olive oil and add the sausage. I bought fresh links and took the sausage out of the skins. Let the sausage brown until almost cooked through. Add in the onions and garlic and sauté about 2-3 minutes. Add in the rest of the vegetables and stir until everything is combined. 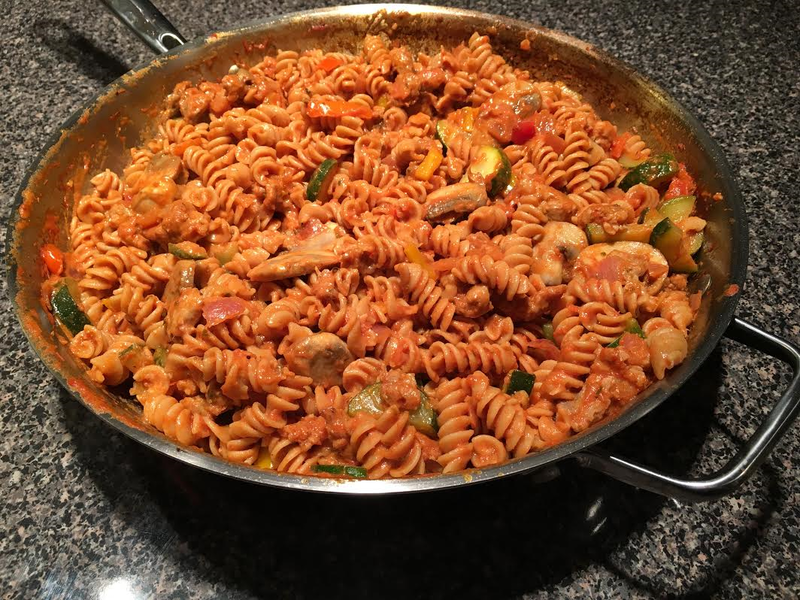 Cover the pan with the lid partially and stir periodically until the peppers, mushrooms and zucchini look almost tender. Turn the heat down a few notches and add the pasta sauce and Worcestershire sauce. Mix everything to combine well and continue to cook about 10 minutes, or when the sauce is nice and hot. Turn the heat off on the pan. If your pan is large enough, add the pasta and the sour cream right in. Carefully toss until everything is combined. In a saucepan, cook the 1 cup of raspberries, water and lemon juice over medium heat stirring frequently. Remove from heat after the raspberry sauce thickens. Rinse tenderloin, trim off any membrane and pat dry. 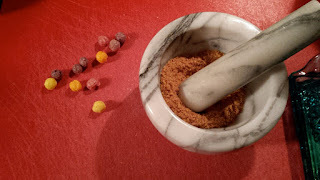 In a small bowl, combine crushed Chocolate Cheerios, ground coffee, cinnamon, ground cloves, Piment d’Espellette and salt for the rub. Firmly pat a generous coating of rub onto the roast. Heat 3 Tablespoons of olive oil in Dutch oven on the stove top. Brown all sides of filet over moderate heat. Finish cooking roast in oven, until thermometer placed in center reads 120°F to 125°F for rare, 130°F to 135°F for medium rare, 140°F to 145°F for medium, 150°F to 155°F for medium well and 160˚F and above for well done. Remove filet from oven and let stand for 20 minutes before carving. Cut the baguette into 1/4-inch diagonal pieces, brush remaining olive oil on one side of the bread, sparingly sprinkle with thyme and bake in 350°F oven until toasted to golden brown. Place a thinly sliced piece of tenderloin on each toast and spoon approximately two Tablespoons of raspberry sauce over them. Top each piece of roast with either a cilantro or watercress leaf and crown with one of reserved raspberries. Crisps and cobblers have always held a special place in my heart due to their homey-ness and customizability. Portion size is always negotiable, further lending to their appeal. The texture given to this crisp by tasty Golden Grahams Cereal makes it especially enjoyable. Gild the lily if you like with ice cream or powdered sugar (or both), or just enjoy the crisp as a warm reminder that cereal is not just for breakfast anymore. To the bowl of a food processor, add walnuts and butter. Pulse until walnuts are roughly chopped. Add Golden Grahams Cereal and pulse until cereal is well chopped. Spray pie plate with vegetable spray. Press crust ingredients into pie plate and set aside. In a sauté pan large enough to hold all filling ingredients, melt butter over low heat. Peel and core apples, cut into wedges, then cut each wedge into 3 chunks; working quickly to prevent browning. Add apple chunks and Craisins to melted butter. Add salt, cinnamon and brown sugar, stirring well. Cook and stir until apples have softened but still hold their shape, about 8-10 minutes. Pour in brandy, stir, remove filling from heat. 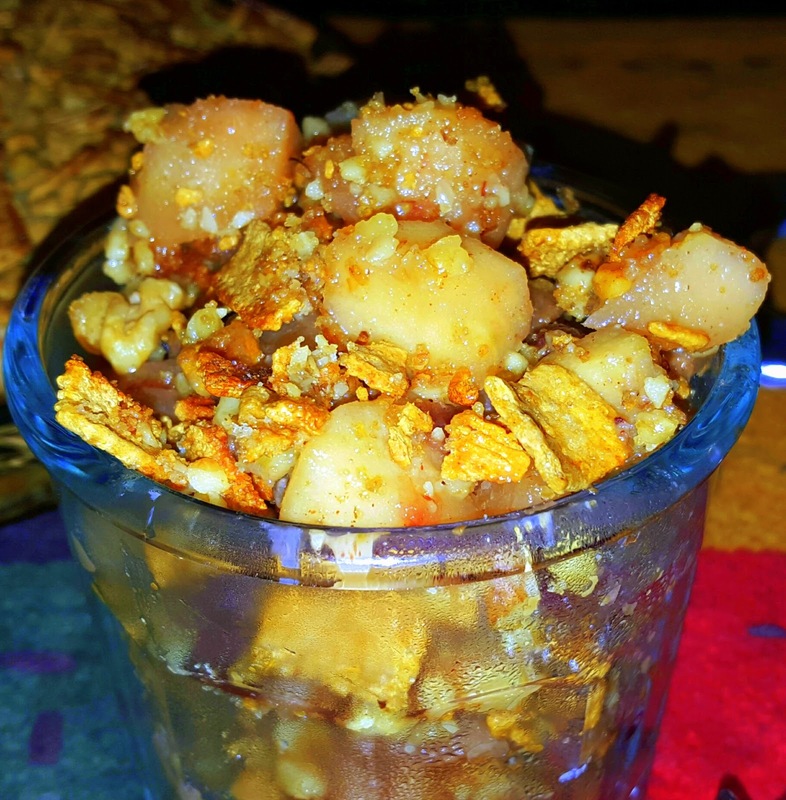 Toss together in a bowl the nuts, cereal, melted butter, brown sugar and cinnamon. Reserve cold unsalted butter dice for final assembly. Spoon cooked filling on top of crust mixture in pie plate. Place generous handfuls of topping onto apple mixture. Dot topping with cold butter dice. Place pie plate on a sheet pan to catch drips. Bake in preheated oven for 15 minutes, or until topping is browned. 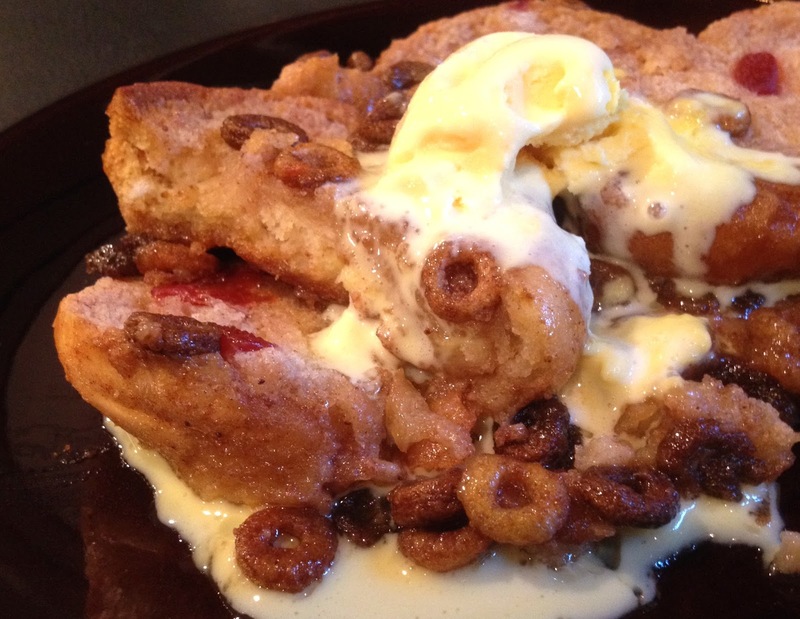 Serve with ice cream or powdered sugar if desired. These are quick and easy to make and even on a cold winter day will evoke memories of camp fires and marshmallows. in a microwave safe dish and place in the microwave. Cook for 2 1/2 minutes. Stir this mixture into the cereal mixture. Pour into the 8 x 8 baking dish. Let sit 30 minutes and then cut into squares and serve. You may be familiar with the situation: Ohmygosh, it's six o'clock, and I have to have supper on the table! What do I do now? Aviva Goldfarb has your back, she's been there. She is a cook, author, and founder of the website The Six O'Clock Scramble, a weekly meal planning system. I was sent a copy of her latest book, written in cooperation with the American Diabetes Association. The Six O'Clock Scramble Meal Planner: A Year of Quick, Delicious Meals to Help You Prevent and Manage Diabetes presents 32 weekly menu plans, complete with main dishes and sides, with a grocery list for each week. All the recipes are diabetes-friendly, whether you're managing the disease or trying to prevent it. 12 ounces precooked meatless mini meatballs (often sold frozen), or use beef or turkey meatballs I couldn't find 12-ounce packages of meatballs, so I used 1 lb Italian meatballs from Trader Joe's. I thawed them in the microwave and then cut them in half. In a large stockpot, heat oil over medium heat. Add the onions, carrots, and garlic; sauté, stirring occasionally, until the vegetables are tender, about 5 minutes. Add the stock, water, and tomatoes; cover and bring to a boil. Add the Italian seasoning blend, the orzo and the meatballs (if they are large, cut them in half or quarters) and stir frequently for a minute or two, so the pasta doesn't stick to the bottom of the pot. Reduce heat and simmer, partially covered, for 15 minutes. Stir in the spinach and let it wilt. completely disagree. While this soup tastes good right when it's made per instructions, it's SO MUCH BETTER the next day or even the day after, when the flavors have had time to meld. My advice is to put this soup together when you're making some other day's supper - and then just stick it in the refrigerator for tomorrow. 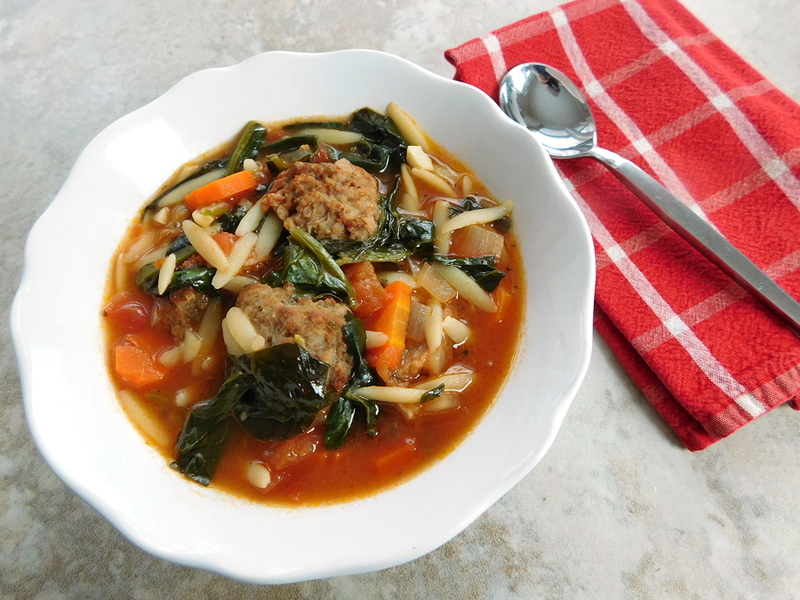 You'll thank me for this; you'll have an amazingly wonderful soup and all you have to do is heat and eat. 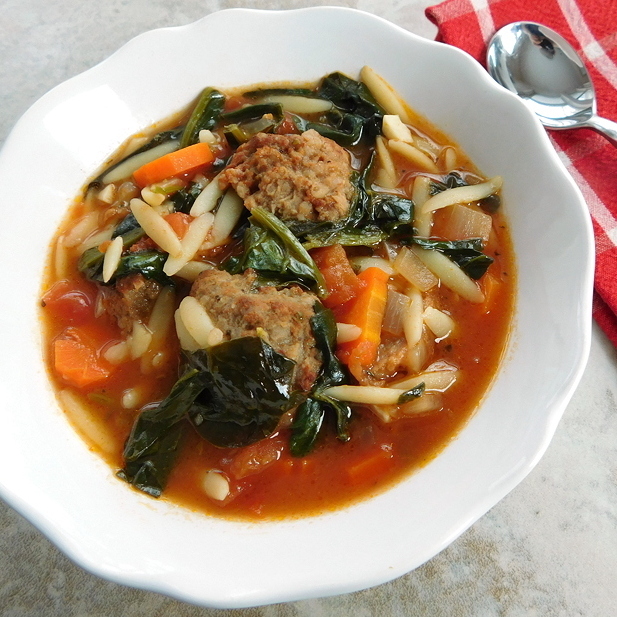 If the pasta has thickened the soup too much, which it can do, just add some V8 or tomato juice to bring it back to your ideal soup-like texture. We also loved the soup garnished with a sprinkling of grated Parmesan cheese. While I don't live with the six o'clock scramble day in and day out, I'm glad to know I've a resource to turn to. 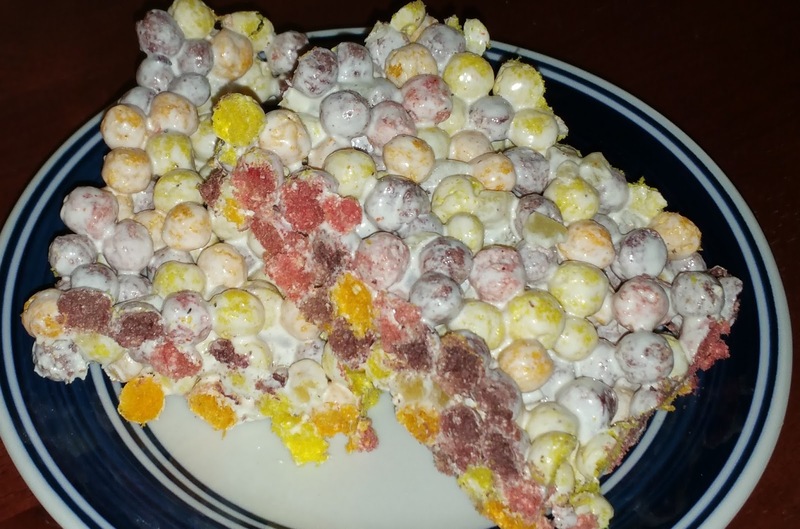 When I first found out that I got to use Trix cereal in a recipe, I was excited and terrified. What could I do that wouldn't be a desert, or really sweet, or me just eating the entire box in one sitting? Well, I happened to be searching my freezer for something (no clue what) and when I opened it, a bag of green beans fell out (narrowly missing my toes) and I figured that was a sign if ever I saw one. This simple recipe came from that. Hope you enjoy. Add green beans and saute for 3 minutes. Add 2 Tablespoons of crushed Trix. stir to coat and saute for 1 minute. 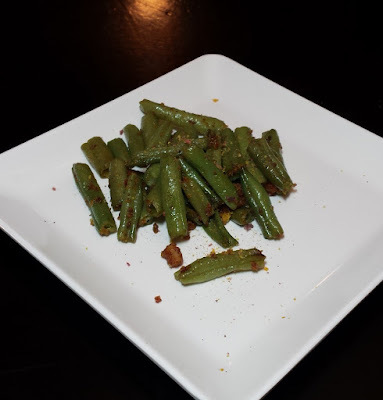 Remove green beans from heat and plate. Sprinkle with remaining crushed Trix and serve. Preheat oven to 350°F. Spread miso paste on parchment paper until about 1/4" thick. Bake for about 30 minutes, until well burnt. Remove from oven and cool. Blend burnt miso with remaining ingredients until smooth and fully incorporated. Melt butter in a pan over low-medium heat. Add apples, sugar, water and cinnamon stick and mix together. Stir until apples are tender and the water has evaporated. Put Golden Grahams in a food processor and blitz until you get cereal crumbs. Using a round cookie cutter, start by placing cereal crumbs on the bottom layer, followed by a second layer consisting of apples. Remove the cookie cutter and finish plating with a smear of the burnt miso topping. Heat about 2 inches of oil to low-medium heat for a gentle deep fry. 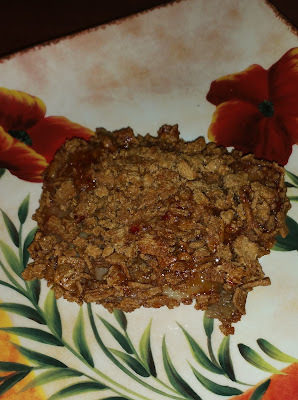 In a medium bowl break up apple slices into small pieces. Add egg, brown sugar and granulated sugar and mix until just combined. 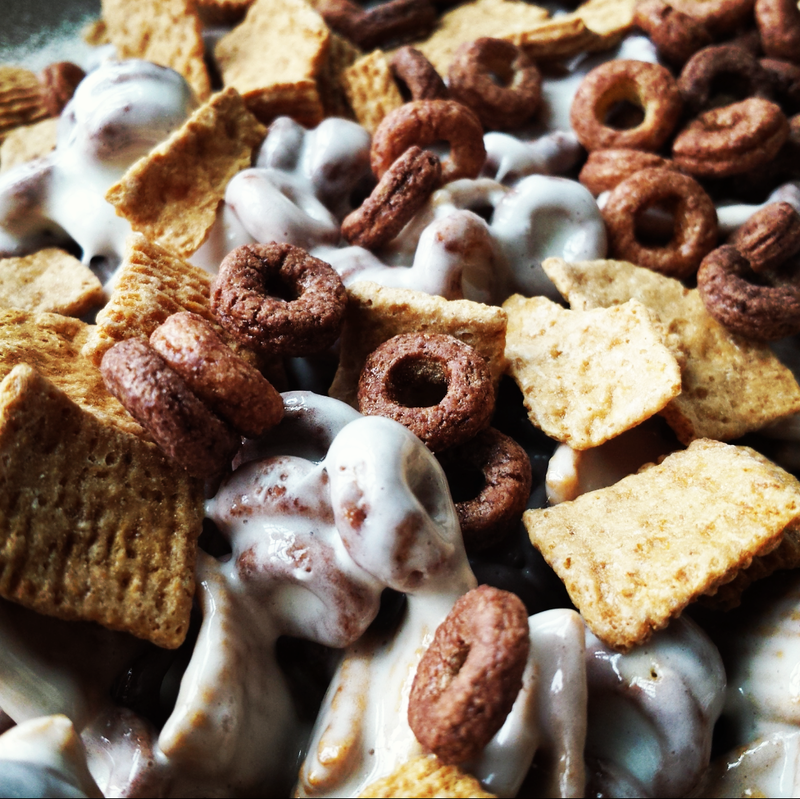 In a medium bowl add the Golden Grahams and the Chocolate Cheerios. Crush cereal into small pieces with your fingers. Add the flour and cocoa powder and combine. Add the apple mixture and mix until a soft dough forms. Form bite-sized pieces of dough with a small spoon and fry gently for about 5 minutes, being careful fritters float and don't touch bottom of pan. 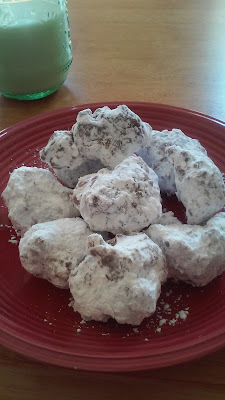 When fritters are done, toss in powdered sugar. How lucky and honored I am, to be part of a group that is sponsored by General Mills! General Mills sent each of us 3 boxes of their updated cereals, which contain no artificial flavors or colors from artificial sources. I had the opportunity to try and play with these updated cereals before they were available in stores. I'm willing to bet that all ages like cereal. As a child, I had it often with milk. As an adult, I eat cereal as a crunchy snack. Cheerios have always been a favorite of mine. Chocolate Cheerios?! Oh, yes! I had a mug of Chocolate Cheerios last night. I chose Trix for my recipe because I love all the colors and the resounding crunch. Plus, they make me think of spring, which is finally here again. So, if you haven't had cereal in awhile, run to the store and buy a box or two of Chocolate Cheerios, Trix or Golden Grahams and feel like a kid again! Spray an 8-inch square baking dish with Baker’s Joy baking spray, or similar. In a medium bowl, combine the softened cream cheese and powdered sugar. Mix until almost combined. Add the vanilla extract and mix until smooth. Place the chopped white chocolate in the top bowl of a double boiler. Melt the chocolate over lightly simmering water. Don't allow the water to boil. Stir the chocolate until completely melted and smooth. 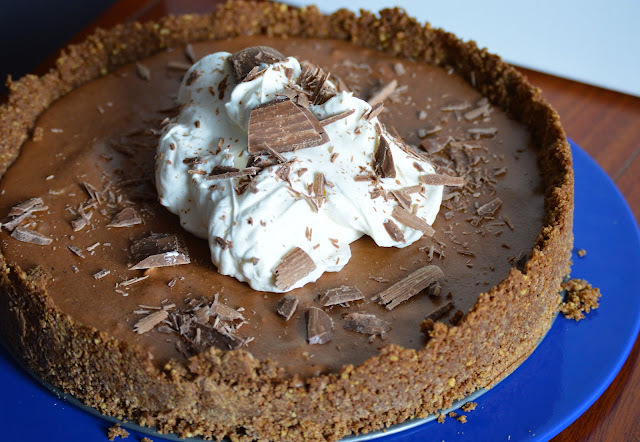 Fold the melted chocolate into the cream cheese mix. 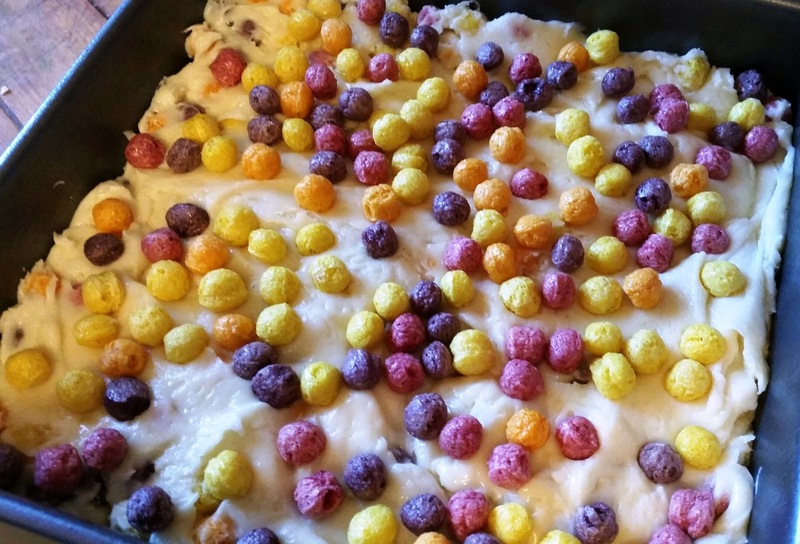 Add 3/4 cup of Trix cereal and lightly mix in. Pour mixture into prepared pan and smooth top. Add about 1/2 cup of Trix cereal to the top and lightly press into the fudge. Chill for an hour. Cut into 1-inch squares for serving. Note: I suggest using white chocolate and not white baking chips. Best served the same day. Crunch, crunch, crunch. The moment I received the General Mills cereal in the mail I immediately opened all three boxes and had a sample of each one. It was research! Seriously! Okay, okay, so I was immediately transported to my youth, eating breakfast at our round, formica-topped kitchen table with a plastic bowl full of milk with those beautiful little rings of General Mills Cheerios floating on top, and my mother’s seeming daily effort to get my brother and sister and me to finish up so that we wouldn’t miss the school bus. That was a long time ago and things have certainly changed. General Mills is beginning to phase out the use of artificial flavors and colors in their cereal, and I couldn’t be more pleased! We’re all so much more conscious of the quality of the ingredients in our food. Kudos to General Mills! As for the challenge at hand, I wanted to make something savory with their cereal just to shake things up a bit. So I opted for a Mexican flavor profile in the form of a stuffed mushroom appetizer. I used the GM Golden Grahams in this recipe and it did not disappoint. 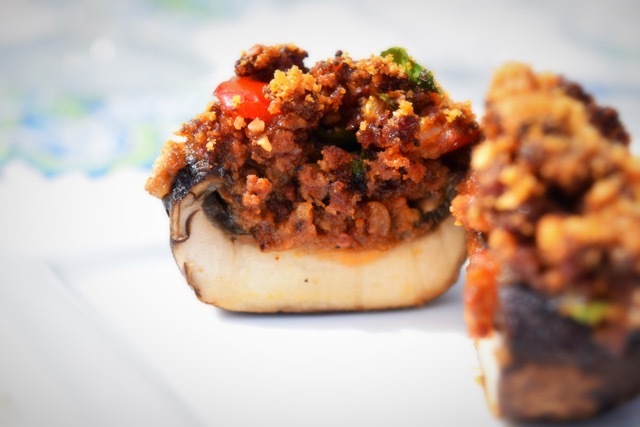 This recipe makes 12 stuffed mushrooms (just enough to get a small party started). Preheat the oven to 325°F. Brown the chorizo in a skillet for about 5 to 7 minutes, until brown and a little crispy. Drain off any excess fat. Add the chopped cremini mushroom stems, scallion, red bell pepper, and serrano pepper. Sauté for an additional 8 to 10 minutes. Remove to a medium-sized mixing bowl. Add the bread crumbs, Golden Grahams crumbs (reserve 1 Tablespoon for topping), Parmesan cheese (reserve 1 Tablespoon for topping), and remaining spices. Mix well. 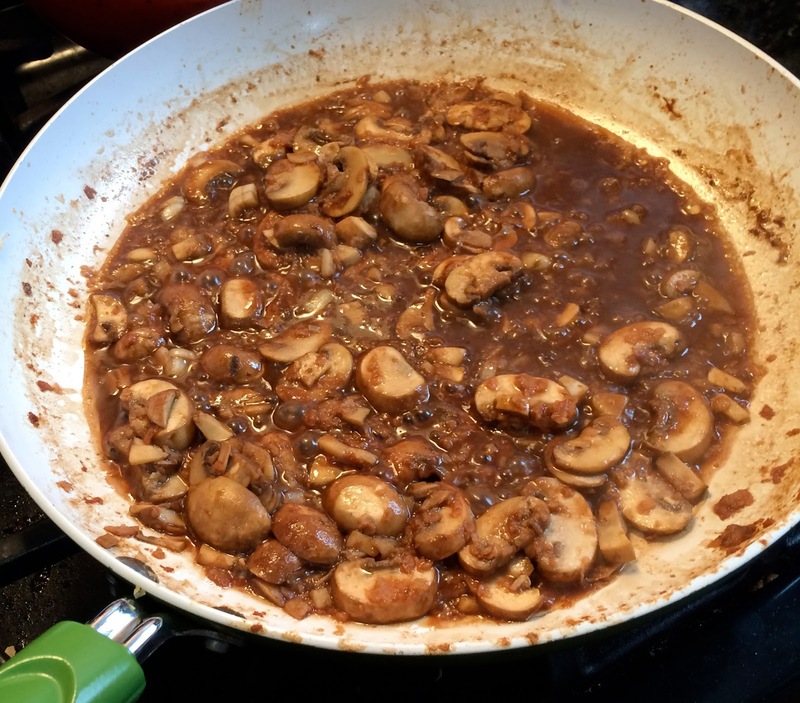 Stuff each mushroom cap with about 1 Tablespoon of stuffing and place in a shallow baking dish that is just large enough to hold all 12 mushrooms. 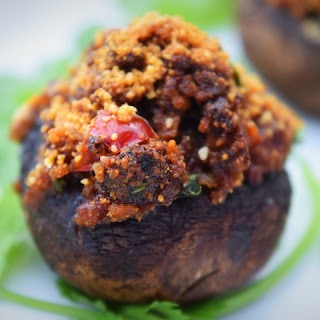 Mix the reserved Golden Grahams crumbs and Parmesan cheese and sprinkle on top of each mushroom. Bake for 45 minutes, until they are brown and crispy on top. While this certainly isn't an original recipe, it's definitely a twist on the classic well-known treat. Most of us remember making this treat with our moms, but with this recipe, there's a slight note of the cayenne with each bite - certainly for the adult in all of us and it brings back childhood memories. In a large saucepan, melt butter over low to medium heat. Add marshmallow fluff and stir until the fluff and butter are fully incorporated. Add vanilla and cayenne and stir until well mixed. Then add half of the General Mills Trix cereal and candied pineapple and mix well, then add remaining General Mills Trix ensuring that the cereal is completely coated. Remove from heat. Immediately place the mixture in a 12 x 9 x 1 inch baking sheet lined with wax paper. Use either a silicone spatula that's been coated with cooking spray or another sheet of wax paper to press evenly into baking sheet. Let the mixture cool then cut into squares. We love chicken at this house. 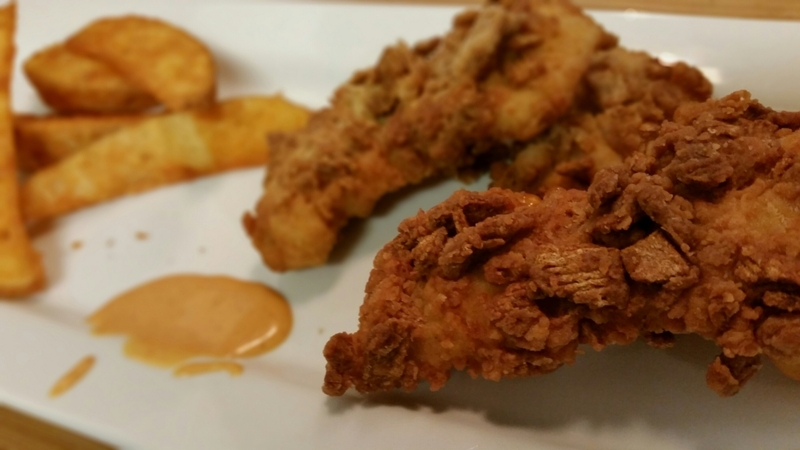 I am always trying to think of new and exciting ways to mix it up with sauces, breading and different techniques and thankfully chicken is so versatile. 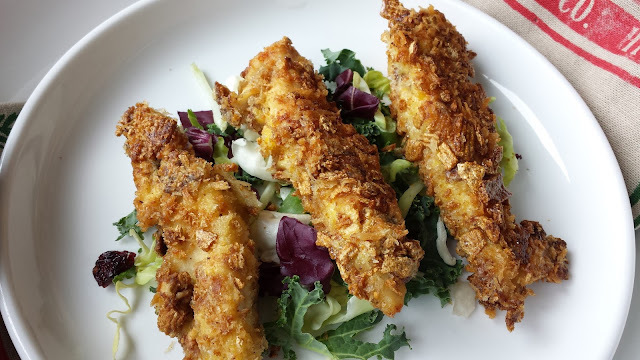 We also are big fans of Golden Grahams cereal, so when this challenge presented itself, I jumped in knowing I would use the cereal as the crust on chicken! Some words of advice before attempting this recipe. Make sure the chicken is cut thinly so it cooks quickly in an effort to avoid burning due to the sugar in the cereal. Also keep the heat at medium which will also help in that regard. Everyone in the family loved these chicken fingers – crispy and delicious! Salt and pepper the chicken fingers. It really makes a difference when you season at each step. Create your dredging station as follows: One container with the seasoned flour, the second with the egg mixture and the third with the Golden Grahams crushed cereal and panko. Heat the canola oil in a nonstick skillet or seasoned cast iron pan – to medium (around 300°F). Dredge each chicken finger first in flour, then egg, then the cereal mix. I like to place them on a rack inside a sheet pan to let them set up for five to ten minutes. Normally, I would recommend refrigerating to help the crust adhere – but you want these to cook quickly – so avoid that. Fry four to six fingers for approximately two to three minutes on each side (your chicken fingers should be thin enough to be completely cooked in this short time) – watch them carefully – the first time I fried a few the oil was too hot and these fingers burnt quickly. Remove from oil and land them on another rack over a sheet pan – so they remain crispy. These were so delicious! 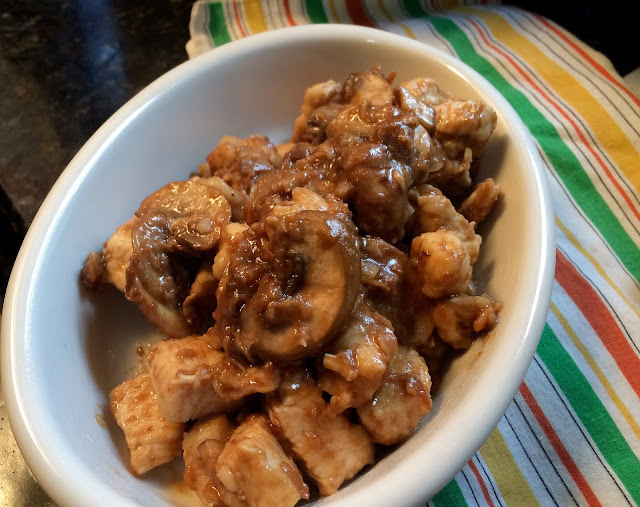 I served them with a honey barbecue sauce but they would be great with honey mustard or any sauce of your choice. Happy National Cereal Day everyone! Whether you eat it straight out of the box or in a bowl with milk, everyone loves cereal! 37 Cooks has been honored to work with some great products from our latest sponsor, General Mills, and our creative gang had a lot of fun creating recipes that include Trix, Chocolate Cheerios and Golden Grahams. Check out today's elegant appetizer by Sarah Kwan. 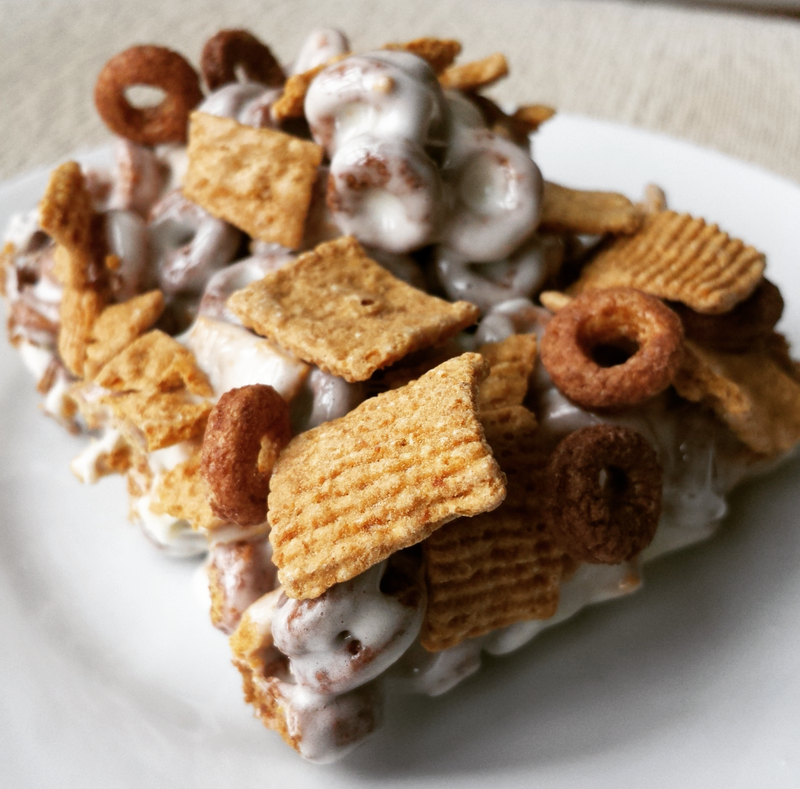 Her recipe shows us that cereal isn't just for breakfast anymore! I love easy party bites, and these are so quick to assemble - with no heating required! If making ahead, wait until serving to sprinkle the Golden Grahams on top to preserve their crunchy texture. The per-fig measurements mean you can scale this up and down easily, depending on how many pieces you'd like to serve your party. Arrange the figs on a serving plate. 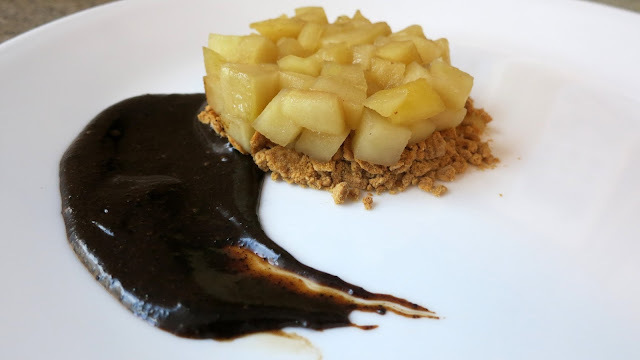 With a soft silicone pastry brush, brush the cut side lightly with balsamic vinegar. 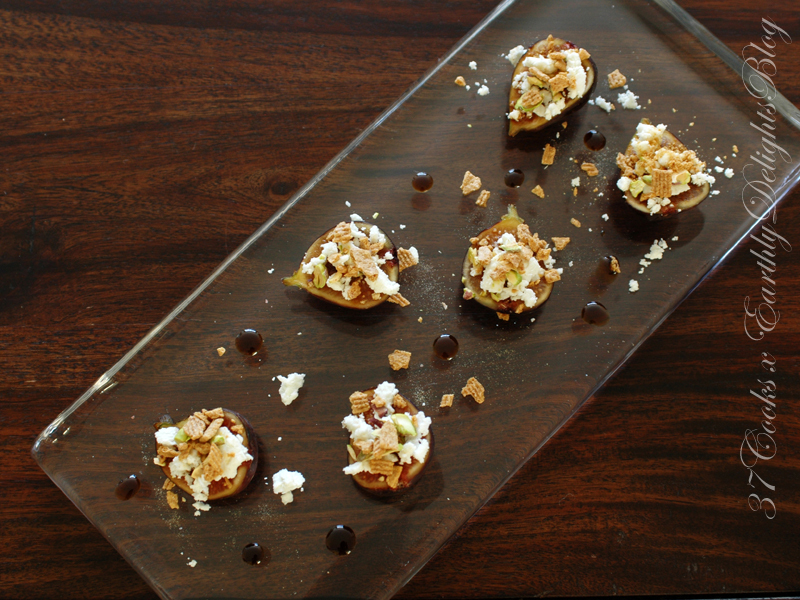 Press a half pistachio in the center of each fig half, then spoon about 1 to 1 1/2 teaspoons of goat's cheese on top. Chop the remaining pistachios, and sprinkle on the goat's cheese. Sprinkle the crushed Golden Grahams on top and serve immediately. If desired, add a few more drops of balsamic vinegar around the plate. My kids think that I am the best mom around when I serve them nice cream for breakfast. Nice cream is just like ice cream, only so much healthier. So healthy that they can have it for a fun breakfast, or it could be turned into a dessert with just a little honey. It starts with frozen bananas that give it a great creamy base. Once you have mastered the base, it is so easy to change up the flavors. When the cereals from General Mills arrived and I saw the Trix, I knew that a frozen nice cream had to be made. 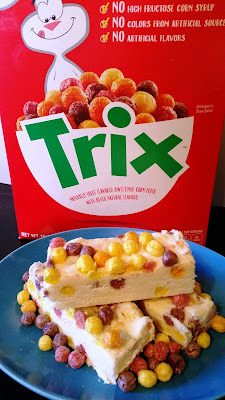 Between the fun colors of the Trix and ‘ice cream’, I knew that it would make my kids' morning. Not only did they love it, it was requested for when they have friends over. I loved the creamy nice cream layered with the crunchy Trix - it gave the parfait a nice balance. I made the nice cream in a high-speed blender, but you can also make it in a food processor. It will take a little longer and you might not need the full amount of milk. I use really ripe bananas - the riper they are, the sweeter they will be. I do not use a sweetener in my nice cream, but feel free to add one if you want it a little sweeter. 1. Place the Trix in a paper bag and crush. Set aside. 2. Add your almond milk to a high-speed blender followed by the bananas, rosehips powder and strawberries. Blend, tamping down constantly. It will take about 30 seconds and you will have a soft-serve consistency. 3. By hand, stir in the crushed Trix. 4. Layer in a cup or jar alternating the nice cream and Trix, ending with Trix. There are days when you want a simple salad. And there are days when you want a simple salad with a delightful goat cheese “crouton”! When General Mills offered 37 Cooks their updated healthy cereal selection, I was really impressed! Whole grains, no GMO, lower sugar content. As a busy professional, I often enjoy a salad that includes fruit and protein as my main course for dinner. 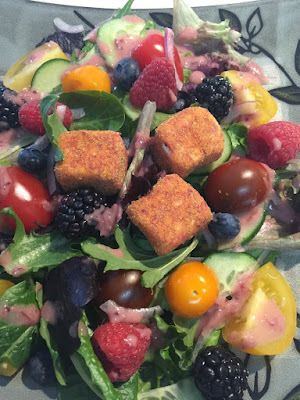 I thought the new and improved Trix cereal was really fruity and a perfect option to coat my goat cheese “croutons” and make this salad a complete success! In the bowl of a food processor fitted with the metal blade, add the cereal, salt and cinnamon. Pulse until the mixture is a fine grind. Transfer to a shallow bowl. Cut the chilled goat cheese into equal .5 ounce portions. Goat cheese can break apart, so I cut it and weighed the portions on a kitchen scale, adding pieces as needed. With your fingers, gently form the goat cheese portions into a square “crouton” shape. Toss the goat cheese squares in the Trix mixture, gently pressing the Trix mixture onto the goat cheese to completely coat. If preparing ahead, cover the “croutons” and refrigerate until ready to serve. Assemble the salad and drizzle with your vinaigrette of choice. Place the goat cheese “croutons” on top of the salad and serve. Sometimes simple just works!